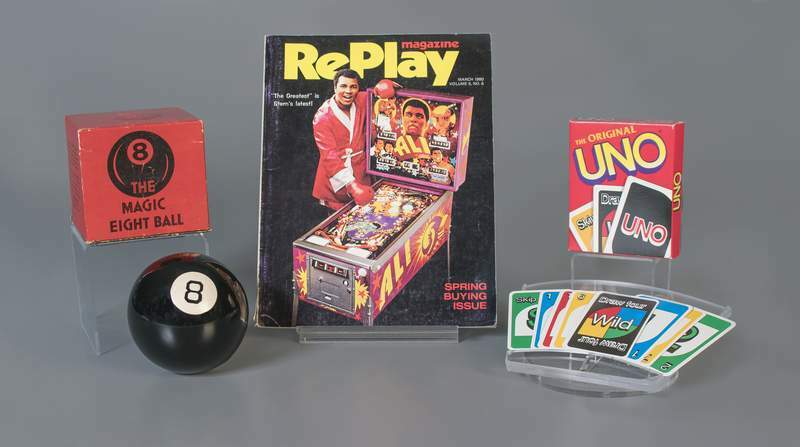 Associated Press The Magic 8 Ball, Uno and pinball are the latest inductees into the National Toy Hall of Fame, joining the likes of Barbie, Lionel Trains and the cardboard box. ROCHESTER, N.Y. – Magic 8 Ball and Uno fans can count on infinitely more fun, along with pinball players whose quarters have powered the arcade classic through the rise of gaming apps. The three make up the National Toy Hall of Fame's class of 2018, recognized Thursday for their staying power and influence. The honorees were chosen from a field of 12 finalists included American Girl Dolls, chalk, Chutes and Ladders, the Fisher-Price Corn Popper, Masters of the Universe, sled, tic-tac-toe, Tickle Me Elmo and Tudor Electric Football. The latest inductees will be on permanent display at the Hall of Fame, inside The Strong museum in Rochester, alongside 65 previous honorees that include the stick and cardboard box to Barbie and Lionel Trains. Anyone can nominate a toy for the National Toy Hall of Fame. After a museum advisory committee culls the list to 12, a national panel of historians, educators and others with expertise in learning and creativity make the final selections. The judges consider longevity and popularity, ability to foster creativity or discovery through play and its influence on play or toy design.